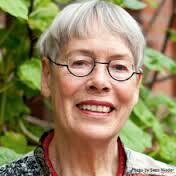 It is with deep regret that we learn that Margrit Kennedy passed away on December 28th 2013. Margrit was a leading light in developing alternative approaches to money and currencies and an outspoken critic of the current global economic system. She lived in Lebensgarten, one of the first ecovillages in Germany, with her Irish husband Declan Kennedy (also an architect by training). Margrit specialised in Urban & Regional Planning with a Ph.D. in Public & International Affairs then becoming professor of Ecological Building Technologies at the ept. of Architecture, University of Hanover. She published books, articles & reports on community school planning/ building, women in architecture, urban ecology, permaculture, money, land & tax systems. Her book, Interest and Inflation Free Money, Creating an Exchange Medium that Works for Everybody and Protects the Earth, was first published in 1987 and has been translated into 22 languages. With Bernard Lietaer she wrote People Money – the Promise of Regional Currencies, which tells the stories of local currency systems from around the world. Her most recent book, Occupy Money, Creating an Economy Where Everybody Wins, makes the case for a table and sustainable monetary system that reflects real wealth instead of the smoke and mirrors of speculative profit. With the recent losses of David Fleming, Richard Douthwaite and Howard Liddell (all too young), Margrit’s passing leaves the environmental movement without another of its more creative & determined advocates in western Europe. You can read the Wikipedia entry on Margrit http://en.wikipedia.org/wiki/”>here. Our thoughts are with Declan and her family.